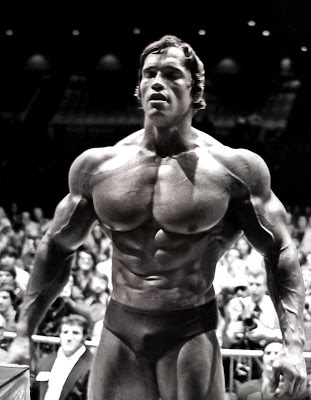 Let's talk about the major component of Arnold's bodybuilding routines: VOLUME. First off Arnold is Austrian, not German. Secondly, he was never formally introduced to German Volume Training till well after he stopped competing. However, he smashed it in the gym with ultra-high-volume supersets and marathon chest work to sculpt those man-steaks, foreshadowing the effectiveness of the German Volume Training approach. More often than not, new lifters [and old dogs who enjoy yelling and being injured a lot] make the mistake of believing that High Intensity Training [HIT] is the Holy Grail, and should be the main attraction in their training programs, only using high volume training for the occasional reprieve from all that 'hard work'. I've known many such individuals who wind up spending a lot of time standing next to the big boys, and lifting the same size weights, but never quite making the gains in muscle size they thought those heavy weights would bring. "Let's be clear about this: there is a time and a place for High Intensity Training in bodybuilding- just not ALL the time..."
HIT Nut: "Yeah, come get you some muscle micro-tears! Did you just see how heavy that weight was?!! I almost blew a gasket bro!" Body Part: "Why would I care: I'm an [obviously] brainless piece of organic matter attached to one of your appendages... which you very nearly injured... very badly." When Charles Poliquin introduced western minds to the concept of GVT back in 1996, well, let's just say that heads exploded: no one had ever really thought of attacking a single exercise for 10 sets, let alone starting the periodization of such a routine with 100 total reps! What would it take? What percentage of your maximum strength/lifts could you use? Most importantly, would it actually build mass?! In all fairness, physical culture legend Vince Gironda had been utilizing high volume '8x8' and 'Ten Sets' approaches several decades before Poliquin came back across the pond with his 'new' findings- but Gironda never placed his methods under the microscope that GVT has been scrutinized under- and regardless of who started using the basics of GVT first, it continues to pass the test of efficacy. BEGINNER: 4-6 weeks only 2-3 exercises per workout, 10x10 @ 60% of your 1 rep max. Perform no more than 4 sessions per week. INTERMEDIATE: If you actually make it to this point, email me and I'll tell you the intermediate routine. ADVANCED: Again, we'll cross that bridge when we get there. As you know, in my blog I tell you about my personal workout, and draw material directly from what I'm doing realtime in the gym. That said, this is the first time I've needed to fire up a GVT program to overcome a plateau in over 2 years, so I'm feeling it out just a little. During sets 4-6, I started thinking "Ok, this might be a little more challenging than I originally thought..."
Sets 7-9 were marked by total absence of internal dialog, as I was totally dialed in/focused on the lift, and very nearly reached failure during the 7th rep of the 9th set [yes, in each and every lift]. Set 10... was surprisingly easy: I used the full 90 seconds of rest allowed, and my phosphocreatine stores were replenished by a significant margin more than they had been during set 9. It works because by the end of all that volume, so many muscle fibers, ancillary stabilizers, and resources are recruited- especially if you focus on getting full range of motion with each rep- that the body is forced to adapt. So, are you stuck in a plateau? Ever tried GVT before? With a low risk of injury, and a high return on the time invested, in terms of building muscle, you've really got nothing to lose. p.s. I'm dead serious about designing an intermediate program for you. Please get to that point, and make the world more awesome, one pound of muscle at a time!